Countries around the world attach great cultural importance to a particular sport; some of these sports are professional and played across the globe and some are so provincial that they seem like weird cultural oddities. Mongolian goat carcass polo, anyone? Whether familiar or obscure these sports are an accurate and important reflection of a country’s culture. All of China frets over its badminton and table tennis prowess, the United States twists anxiously as the world gets better at baseball and basketball and, in the time of its economic malaise, Spain takes solace in its nation’s success on the soccer pitch. Hockey is Canada’s sport and you’d be hard pressed to find a boy who hasn’t played it on ice, as John did, or in the street as Hunter and Jack do. And I think it is pretty safe to say that all kids who pick up a stick eventually raise their arms above their heads in Gretzky-like jubilation following an imagined Stanley Cup clinching goal. He shoots, he scores. Arrrhhhhhh!!! Even in fantasy the satisfaction is sincere. Hockey and the Stanley Cup in particular are very big deals in Canada. Canada has become so culturally diverse, and the NHL now barely contains a majority of Canadian born players, yet the fervor of the Stanley Cup playoffs has never been greater. This mania is notable, in part, because it is totally unrelated to the location of the competing teams; after all, a Canadian team hasn’t won Lord Stanley’s Cup since the ’93 Montreal Canadiens. For the months of May and June all conversations invariably involve some educated commentary about the prospects of one team or another. Six chicks drinking cosmopolitans are no less susceptible to strident opinion than six lumberjacks debating power-play technique. The majestic Stanley Cup is the reward for the longest and most grueling championship of any professional sport. After the regular season in which 30 teams play 82 games each the top 16 teams qualify for the play-offs, which is an elimination tournament. These teams are paired off and play a best of seven series. The winner of each series moves on to the next round until only two teams remain. These last two teams compete, still in a best of seven series, for the Stanley Cup. Grown men sublimate ego, adopt superstitions, sacrifice teeth and abandon facial grooming in their quest for the holiest grail in professional sports. The Vogel clan does not have an accomplished skater amongst us, however we are very fortunate to have a great friend in Willie Mitchell. In addition to being the very lucky husband of the beautiful Megan, Willie is an enthusiastic fisherman, a fan of great food and wine and a sentimental dog-owner. He also happens to be a newly inducted member of the rare fraternity of Stanley Cup Champions. This year his team, the LA Kings, won the Stanley Cup after only making the playoffs by the slimmest of margins. It was a team that came together during its play-off run becoming a juggernaut of board crashing wingers, agitating centermen and old school stay-at-home defensemen (Willie! ), all holding fort in front of a goalie as flexible as Gumby and with the reflexes of Spiderman. Willie manned the ramparts more often and longer than almost every one of his teammates and, in doing so, realized the great Canadian dream. When we moved back to Canada in 2006 everyone advised me “don’t let your kids play hockey”. They foretold of grim 5 a.m. practices, smelly equipment and endless away games in frozen outposts. My boys weren’t clamoring to play and I wasn’t about to impose this misery upon myself. Soccer was a perfectly sensible alternative to me. Plus I could walk the dog during the games. Willie’s parents, on the other hand, would drive five hours from the tiny hamlet of Port McNeill to watch Willie play a one hour game. And then they’d drive five hours back. 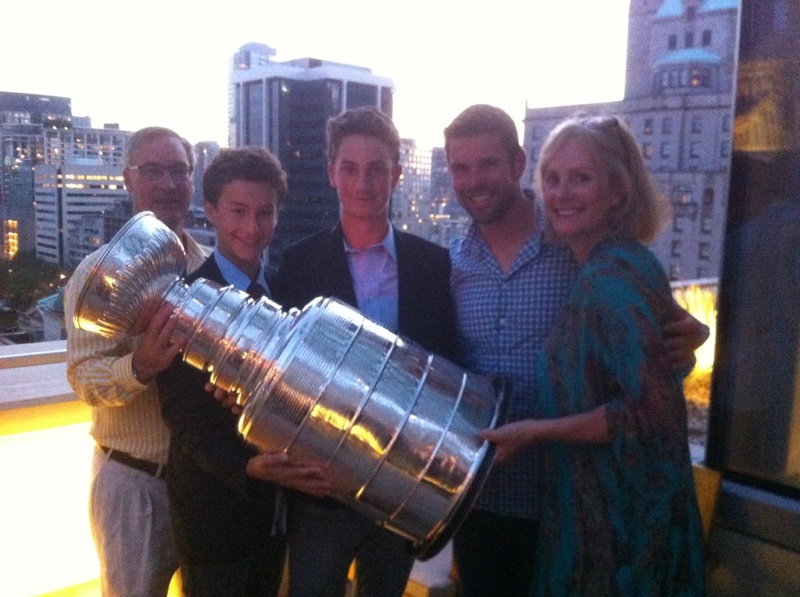 Needless-to-say, Willie is blessed with extraordinary parents and it would not be trite to suggest that the Stanley Cup victory was a multi-generational achievement. In fact, the entire town of Port McNeill celebrated the LA Kings’ victory with a communal sense of pride and elation that might have rivaled the V-Day victory parades of 1945. The second coolest tradition in play-off hockey actually occurs after the finals are over and the champion has been determined: Each player, coach and equipment manager on the victorious team is allowed to have the 3 ft. tall, 35 lb. Stanley Cup for twenty-four hours. The Cup has been used at baby christenings and wedding ceremonies…… and has been mildly defiled in strip joints and drowned in swimming pools. Willie chose to share his success with the entire town of Port McNeill. It was the greatest thing that ever happened to this hockey mad town, population 2,000. 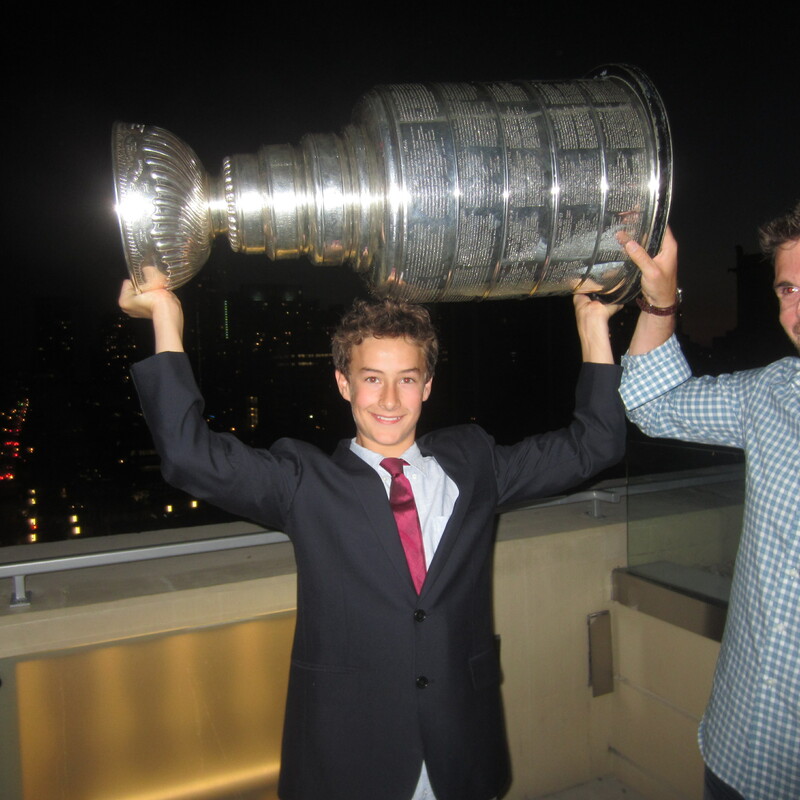 The stay-at-home defenseman appropriately returned home with the Stanley Cup. The Vogels were lucky invited guests. 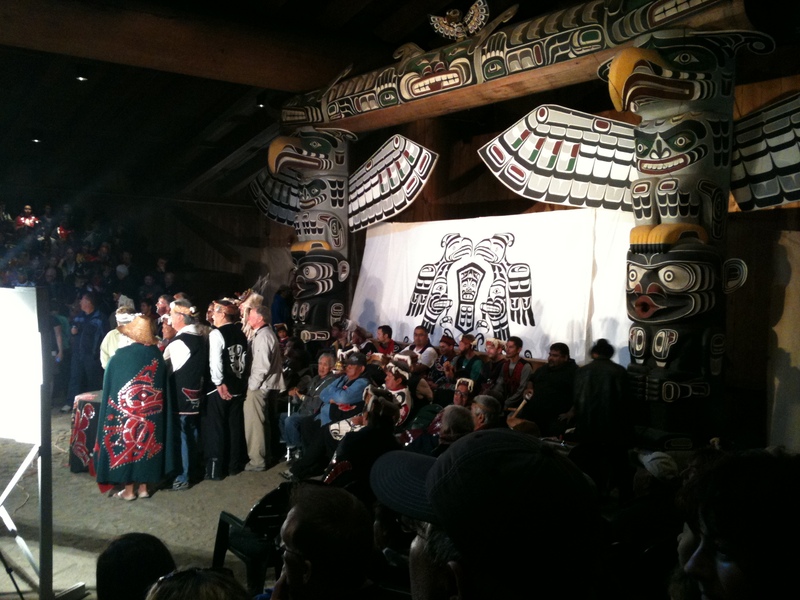 August 12, 2012, was declared Willie Mitchell Day and 5,000 people from across northern Vancouver Island joined in the festivities. Family, friends and strangers paid homage to Willie in the local rink and the Mayor presented Willie with the Key to the City. Hunter laughed and wondered whether it should be called the key to the village! Key to the Zamboni might have been most appropriate. Amazingly Willie said he recognized most of the faces. These were people he grew up with, watched him his whole career, worked with his parents and hung out with him when he came home every summer. I suspect that having his name on the trophy might not have been the most poignant aspect of winning the Cup. 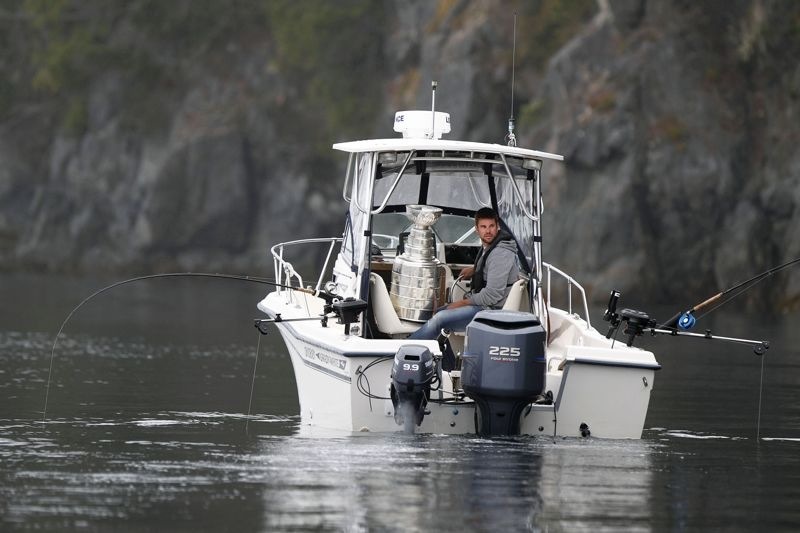 Willie also took the Cup to Alert Bay, a First Nations town, where a special ceremony was held in the Big House, a community centre decorated with thunderbird totem poles and a fire pit in the middle. This was incredibly special for me as it was my first experience of aboriginal culture and ritual. Hundreds of people, many in traditional dress, sang, clapped and stomped as drums were played and dancers performed. Willie was given the name Xanyadzam (which is not a drug for erectile dysfunction but actually translates as “Amazing”) by Chief Bill Cranmer. It is an honour rarely bestowed on outsiders and we were privileged to be witnesses to such an event. The Namgis people honoured Willie not only because he is a hockey star, but because they share a desire to preserve salmon habitat and the environment. They are partners in a land-based, closed containment salmon farm that will be free of antibiotics and pesticides. Opening this fall, it will produce 20 million tons of fresh salmon with no adverse impact on the environment and will help to save the global fish stocks from consumer over-consumption. Needless-to-say, it is a highly admirable initiative that will bring employment to th indigenous community without compromising their environmental integrity. 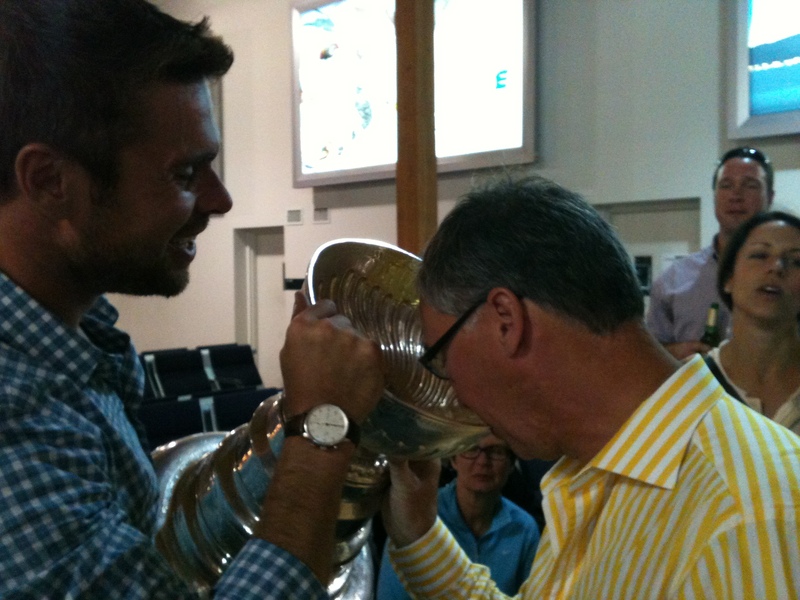 Once thousands of hands had been shaken and photos taken, the Stanley Cup and the Vogels accompanied Willie and Megan to tiny Telegraph Cove (permanent population 20) where we joined the Mitchell’s close friends and family for a more intimate celebration. 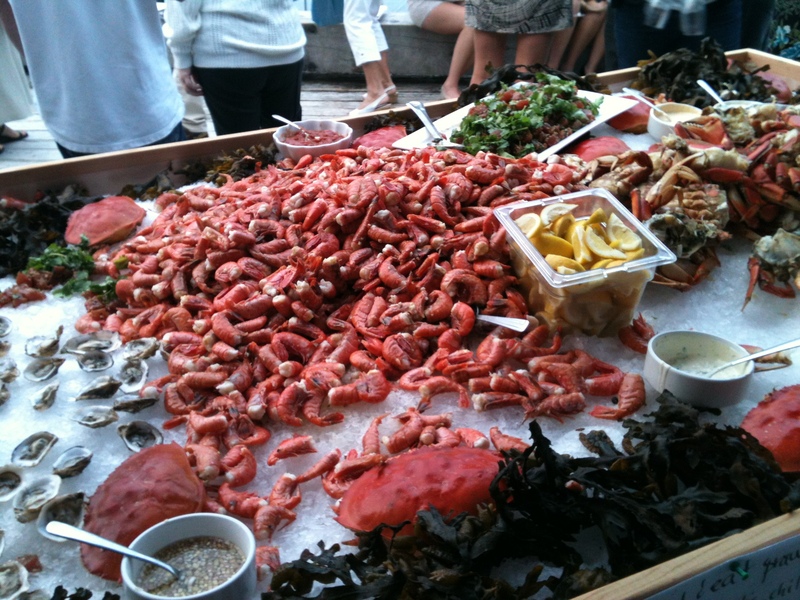 We dined on salmon that had been caught that morning, spot prawns (a local delicacy) and oysters, and drank champagne out of the Cup. 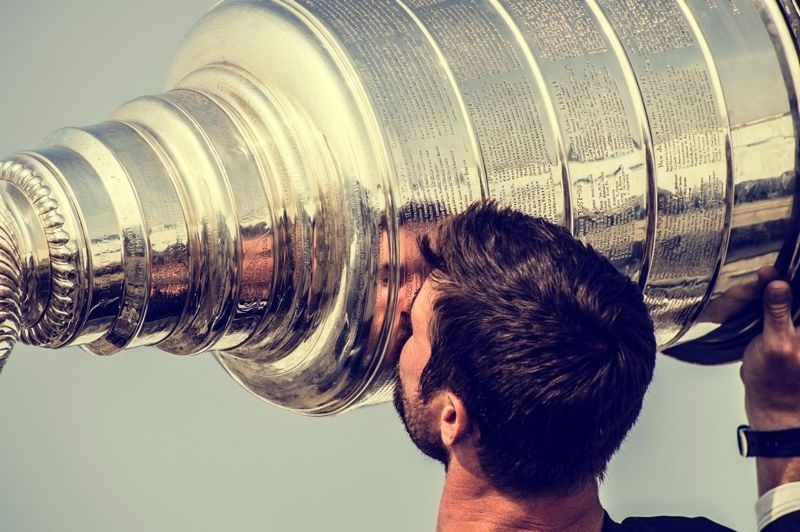 There are many great ways to celebrate important milestones but few can boast the inclusion of Lord Stanley’s gift to this hockey mad nation. At one point during the tumultuous final play-off series Meg eloquently informed me that “winning the Stanley Cup is definitely not for pussies!”. While she is both correct and succinct, I will add that accompanying the Stanley Cup for twenty-four hours is definitely not for pussies either. We limped out of Port McNeill exhausted, bruised, hung-over and very proud to be Canadian. Thank you Willie, Meg and the entire Mitchell family. Oh yeah, Willie, we’d like to do it again next year. So put down the champagne and start back-checking. P.S. The coolest thing about the NHL play-offs is that every round is fought with gladiatorial cruelty yet is concluded with a hand-shake at center ice. Great to get your news. Are you about, or already back to China? Love fro Joe and I to the Vogel clan. Bonsoir Mario, comment vas-tu? Tu vis toujours à Sufford? Comment se porte Joe? Passe lui le bonjour! Je vis à nouveau en France, après avoir séjourné quatre ans en Ukraine. La vie recommence enfin à me traiter comme il faut! C’est assez chouette! PS, Your message came on my birthday. We are in SINC! This is a fantastic salute to a sport that so dear to us Canadians. You’ve captured the essence of the sport and paid tribute to Willie and his family (no one does it alone) to win….as you say….the most gruelling of professional championships and going in as the underdog. 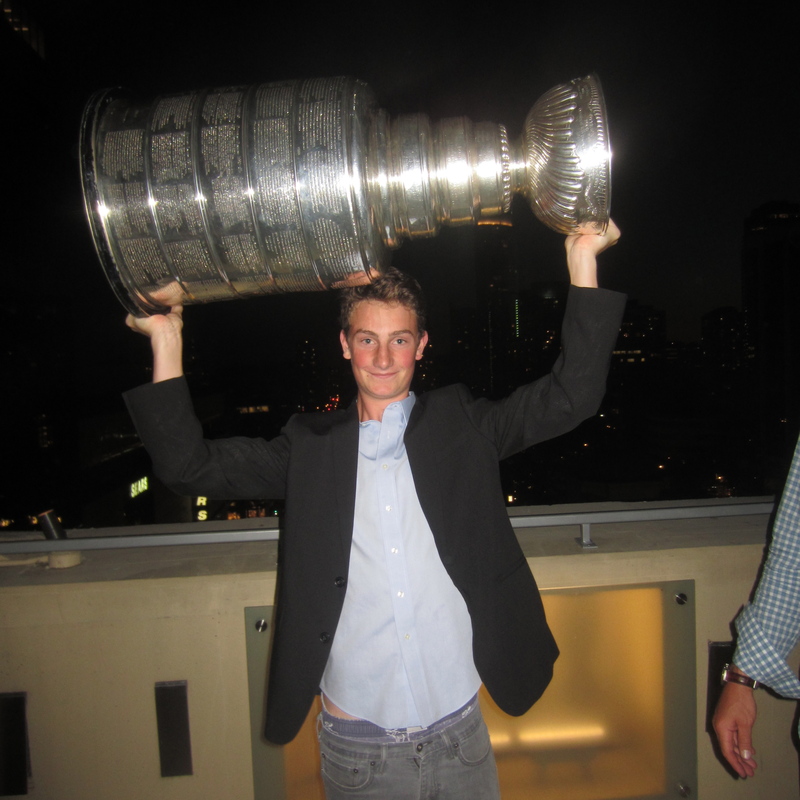 After the Kings toppled the Canucks, I was told (by my son Robert) that the Kings were going to win the cup…..and they did with guts and determination. I raise my glass (champagne of course) to Julie for bringing us to the celebration and to our homegrown hero Willie for bringing home the cup!